It’s the dead of winter and I’m longing for summer. Not because I hate winter, quite the contrary, but because I just finished reading the copy of Fishing the Long Island Coast that I had given my son for Christmas. This new book by Tom Melton (editor of The Fisherman) is just the thing an armchair angler like me appreciates during the forbidding winter months when even thinking about my boat gives me frostbite. 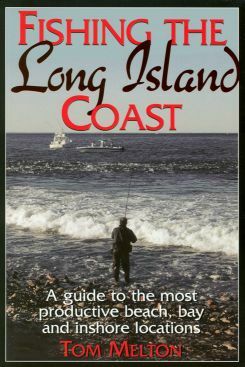 In Fishing the Long Island Coast Tom discusses the fish, the rigs, the locations and the nuances of the Long Island fishing experience. Chapter 1 introduces the fish and explains the best ways to catch them. Although the title of the book is Fishing the Long Island Coast, it doesn’t restrict itself to saltwater fish. There are also some tips in this chapter on catching 7 varieties of freshwater fish. My only complaint here is the lingo. Although I’ve been an avid boater for over 40 years, I’m not an experienced fisherman. I don’t know a hi/lo rig from a 3 way setup, so some illustrations would have been nice. In the second chapter Mr. Melton reveals Long Island’s hot spots. Every place from Staten Island to Montauk Point is covered here. And I have to say Tom does a great job with the details. He gives phone numbers of local bait shops and LAT LON coordinates for each location as well as a good description of what kind of fishing action to expect once you get there. Montauk Point is such a fisherman’s paradise that it gets its own chapter. Chapter 3 is devoted to surfcasting on this spectacular stretch of sand. Like fishing wrecks? Chapter 4 covers 11 of Long Island’s best known wrecks. These are generally close to shore and therefore accessible by smaller boats. While Tom waxes on about how many fish you’ll catch at these wrecks some of the locations are a bit sketchy. And perhaps that is understandable. I suppose there are enough clues and if you watch the party boats they might reveal the exact locations to you. In chapter 5 you get Long Island’s best freshwater fishing hot spots. I’m not one for fresh water fishing, so I didn’t pay much attention here. In a nutshell, they are Lake Ronkonkoma, Forge pond in Riverhead, Fort Pond in Montauk and Blydenburg Lake in Hauppauge. Chapter 6 and 7 are resource chapters listing boat ramps, beach access points, bait & tackle shops, Party boats and charter boats. I’m amazed at the level of detail Fishing the Long Island Coast provides and I have to give Tom Melton a lot of credit for doing his home work. The amount of research he must have done for this book is amazing. This is not a book for beginners, but the armchair angler and the experienced recreational angler alike will find it interesting and informative. Fishing the Long Island Coast is an easy read and has helped me while away a few of the dark winter hours.